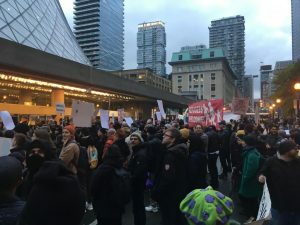 Protesters outside Toronto’s Roy Thomson Hall, venue of the Munk Debate between Steve Bannon and David Frum, 2 November 2018. Photo courtesy of author. It’s been quite a month for the far right in Toronto. Two weeks ago, proto-fascist hype man Steve Bannon – unable just days prior to attract more than twenty-five people to an event in Kansas – drew a sold-out (and well-heeled) crowd to downtown Toronto’s Roy Thompson Hall, where he squared off against former George W. Bush speechwriter David Frum on whether the future of western politics will be populist or liberal, in the latest iteration of the Munk Debates. Eleven days earlier, on October 22, white nationalist Faith Goldy placed third in the city’s mayoral election, tallying 25,667 votes, 3.4 per cent of the total. Finally, on October 28, Toronto played a bit role in Brazil’s election of ultra-right strongman Jair Bolsonaro, with 64 per cent of votes cast by Brazilians in Toronto going to the candidate whose love for military dictatorship was equally clear as his hatred for women, Black and Indigenous peoples, queer folk, and leftists. The experience of living through these events has been, to put it mildly, dizzying – even more so in the context of wider global trends in recent years that have seen varying degrees of far-right populist governments take and maintain power in many of the world’s biggest and most powerful countries: the United States, Russia, India, the Philippines, and Brazil – not to mention the number of countries in Europe also boasting far-right regimes or ascendant right-wing opposition parties. In the face of this moment, both local and global, I’ve spent the last few weeks trying to sort through a wide range of questions. For the sake of brevity, I’ll focus here on just two: What is the role of intellectuals in all of this? And is it possible to have hope? I am not a scholar of fascism, the far right, or any related topic, so this post is more “active” than “history.” To help me work through these questions, I enlisted the help of three friends able to speak to different aspects of the far-right phenomenon: Stephan Mothe, a Brazilian freelance market analyst and writer living in Rio de Janeiro; and two colleagues from the history PhD program at the University of Toronto – Sanchia deSouza, a historian of food and India from Mumbai; and Simon Vickers, who helped organize the CUPE 3902 Flying Squad’s campaign against the Bannon-Frum debate. My friends were not overly bullish on the degree to which intellectuals could contribute to stopping the far right. Stephan, speaking about the Brazilian context, perhaps put it best: “The first way to answer [the question] is that we have to ask ourselves if they [intellectuals] ever were important.” My friends did, however, point to the ways in which thinkers have helped the extreme right. Many of these movements have an intellectual muse – like Steve Bannon – who plays a crucial role in formulating the dominant aesthetics and discourse of the party and leader in question (detailed party platforms tend to be of lesser interest to far-right populists). In Brazil, the right-wing intellectual mantle has been occupied by Olavo de Carvalho, whose best-selling book (which translates roughly as The Minimum You Need to Know in Order to Not Be an Idiot) was one of four adorning Bolsonaro’s desk during his first televised speech as president-elect. And it’s not only sympathetic thinkers who have boosted far-right politicians. As the recent Munk Debate laid bare, liberal intellectuals – ostensibly devoted to the ideals of open debate – have also done their bit to provide platforms to far-right ideology. As Simon reminded me, a major focus of the Flying Squad’s campaign against the Bannon-Frum debate involved revealing the connections between U of T and the Munk Debates’ advisory board. Though the Debates have no formal relationship with U of T’s Munk School of Global Affairs and Public Policy, two of the nine members of the board are Munk-affiliated professors: political scientist Janice Stein and historian Margaret MacMillan. The chair of the Debates, Rudyard Griffiths, is also a senior fellow at the school. Not only did this assemblage of monied Torontonians invite the reprehensible Bannon to our fair city, but they chose, of all people, David Frum – an influential right-wing intellectual in his own right who coined the term “Axis of Evil” and helped to sell the Iraq War, the civilian body-count for which lies in the hundreds of thousands – to be Bannon’s opponent. Calling on Frum to present the dissenting opinion to Bannon’s defense of populism is a bit like assigning an undergraduate class Mein Kampf and then screening Saving Private Ryan for balance and context. Two highly-decorated professors of history and politics should know better. But, for non-fascist intellectuals, is there nothing else that can be done – besides not inviting far-right ideologues to prominent speaking events? Are our struggles to foster a more enlightened, inclusive, and just world merely Sisyphean? The question leads – for me anyway – to one about hope. It’s a commodity that one finds in short supply these days. None of my three friends were very hopeful about the direction of the world – at least in the short-term. Sanchia in fact had recently polled her contacts on social media to ask if they were hopeful, a) for their personal lives, and b) for the world. The overwhelming majority answered that while they had some hope for themselves, they were deeply concerned about the future of the planet. I suspect the (perhaps contradictory) results of Sanchia’s poll could be replicated in many social circles. All this left me feeling rather blue. But then, out of the abyss, came a faint glimmer of hope, from the unlikeliest of sources: Twitter. My friends and I, it turns out, have been doing just what West warns against – conflating hope with optimism. We also, I think, were overlooking some patches of light in what seems like an increasingly dark world – especially concerning the role of intellectuals. We should not forget that significant portions of the right-wing wave are in fact a response to gains made by progressive movements, often with crucial support from intellectuals. As just one example, Jordan Peterson’s rise to fame would not have been possible if not for the impressive advances made by generations of feminist and queer activists – and scholars of women’s studies and gender – including important (though of course incomplete and constantly under-threat) transformations in popular consciousness on sexuality, gender, and sexual violence. For intellectuals – for whom topics like “hope” tend to feel a little icky – I think there are some lessons here. Positive examples notwithstanding, we may not feel optimistic about our role in stemming the tide of far-right politics and their attendant racism, misogyny, homophobia, and/or hatred of the poor (take your pick!). The work may be slow and often unrewarding, but we do have a role to play – through our teaching, scholarship, and public outreach – not only in confronting the far right but in articulating alternative visions for our future. It will often be difficult to perceive any progress, to see reasons for optimism. Indeed, as West explains later in the clip, to have hope is also to invite despair. But we need to “do it anyway,” and turn into the challenge rather than away from it. What other choice do we have? Edward Dunsworth is a Contributing Editor at ActiveHistory.ca and a PhD candidate in the Department of History at the University of Toronto. He tweets at @ehewey. Both Stein and MacMillan have publicly defended their involvement in inviting Bannon to speak, with MacMillan going so far as to compare deplatforming the man behind the Muslim ban to silencing Bernie Sanders.